I’m in five gangs now. I started two. I started the Kitties and the Grape Slushies. CHECK THAT SHIZZ OUT! Three, count ’em, THREE types of rick-rack. Oh yeah, baby. I https://crafternoonnap.wordpress.com/wp-admin/post.php?post=97&action=editwasn’t holding back on this puppy. 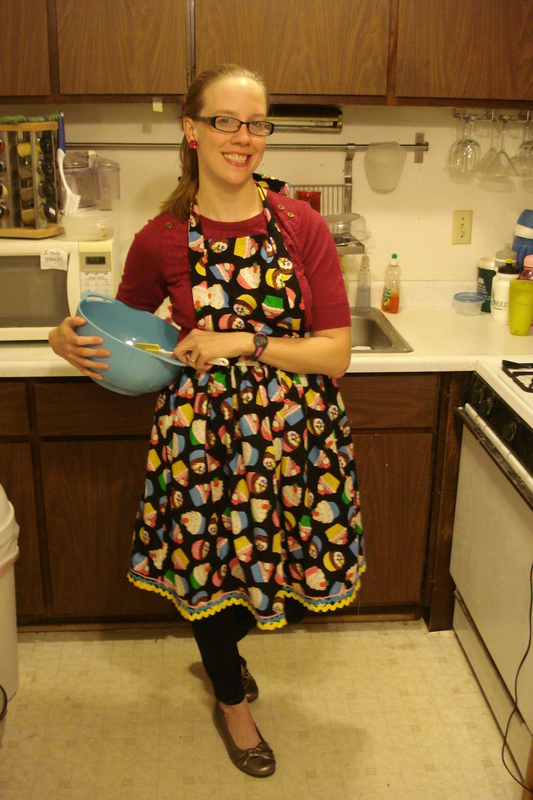 So, as I’ve put in previous posts, I made McCall’s M5358, view B. I wanted a full-coverage apron, as when I cook, bake, and clean, I tend to splatter. I didn’t add a ruffle to the bottom (using the rick-rack as embellishment instead) and I forewent (is that the past-tense of “forego?”) the ruffles on the shoulder straps, and the pockets. 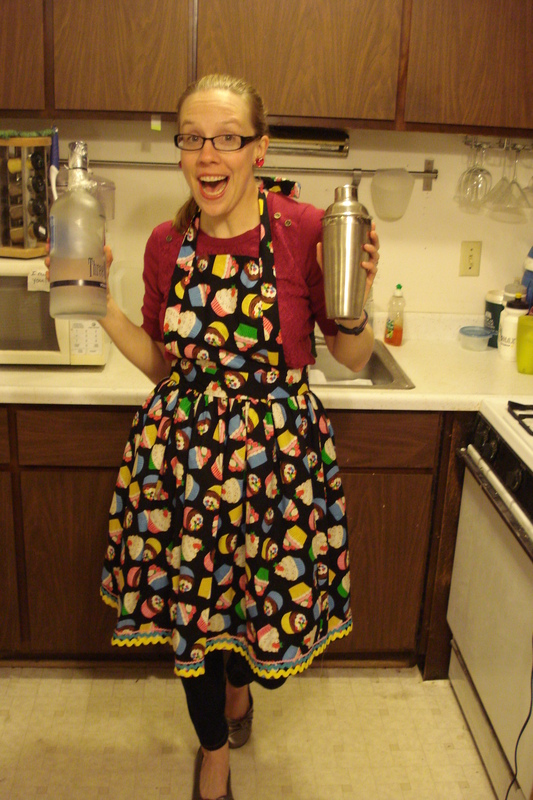 I know pocket-enthusiasts will be up in arms, but I just don’t use them when I’m doing things that require aprons. One thing I’m trying to do is learn to be patient and take my time with the details as I go through my sewing projects. I’m very much an instant-gratification person (which goes poorly for me, as I sew, knit, etc. very slowly), and it leads to both sloppiness and not enjoying the process of DOING since I’m in such a hurry for the result. I can say that I really took my time on some of the details (that rick-rack did NOT go on quickly!) and enjoyed myself the whole way through. I even narrow-hemmed the crap out of those ties. Oh yeah, I did. Time for a full-view…. Whew! Wife-ing is hard work! All that work…Time for a drink! Thanks to Karen for hosting this Apron sew-along. I feel like it really kick-started my creativity and I hope to keep creating now that I’ve re-tasted how much fun it is! Also, big ups to The Hubs for being my photographer today. Baby, you da bomb. MWAH! This entry was posted in Craft and tagged Apron, apronalong, sewing by macstabby. Bookmark the permalink. You cleaned the RoS! Good for you! The apron turned out really cute, I like how full the skirt is. Honestly, it’s still kind of shameful. The Room itself is mostly cleaned up, but some of the stuff still needs to be organized, and has thus trickled into the living room, leaving a thin layer of Shame over parts of the floor. It’s a process! Oh I hear you with the instant gratification! Particularly if its a pattern I haven’t knitted before, I just want to get to the end and know how it turns out. Taking my time and fixing mistakes is something that I’m learning. I know! I’m learning that it’s worth the effort to fix it NOW, than be pissed off about it forever after it’s finished. Flat out awesome apron! 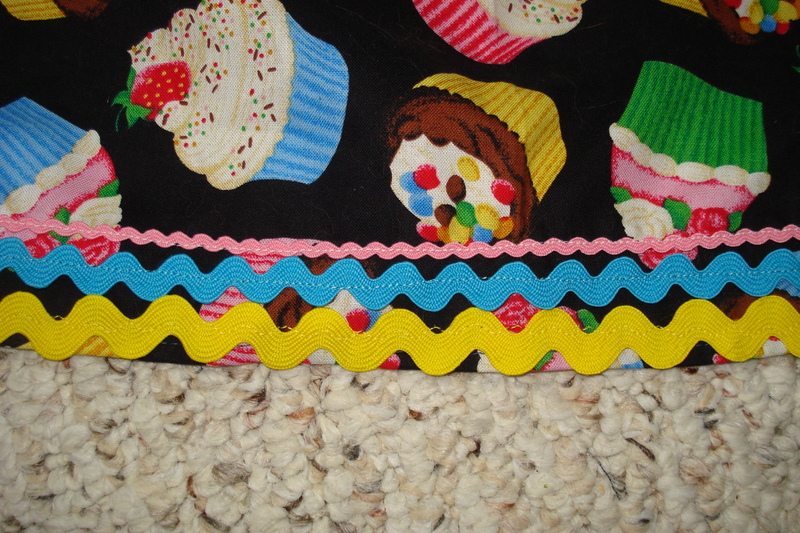 Rickrack, cupcakes, a full skirt…eeeeeeeh, it’s all so fantastically charming.